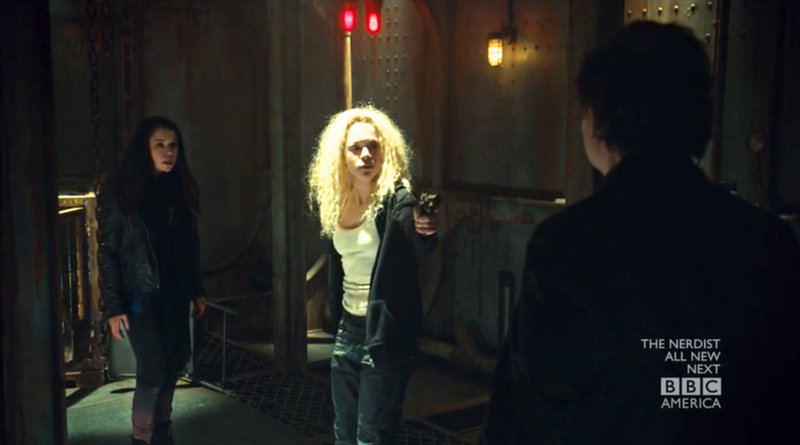 ORPHAN BLACK: It’s true that Helena’s most noticeable attribute usually isn’t her hands (unless you’re fixated on the various weapons she always seems to be holding). 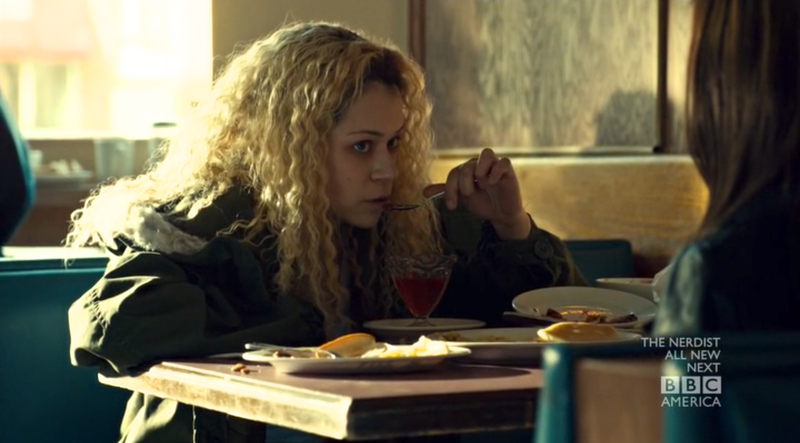 So, the fact that everyone’s favorite Ukrainian serial-killer clone is left-handed brings up a whole slew of religious and psychological issues easily overlooked on a casual viewer’s first Orphan Black binge-watch. In fact, it’s easy to miss Helena’s left-handedness entirely. When we first meet her, in her attempt to kill Sarah-as-Beth, she holds her flying fish knife in her right hand with confidence. Later on, however, she uses her left hand to eat, write, and even hold a gun. 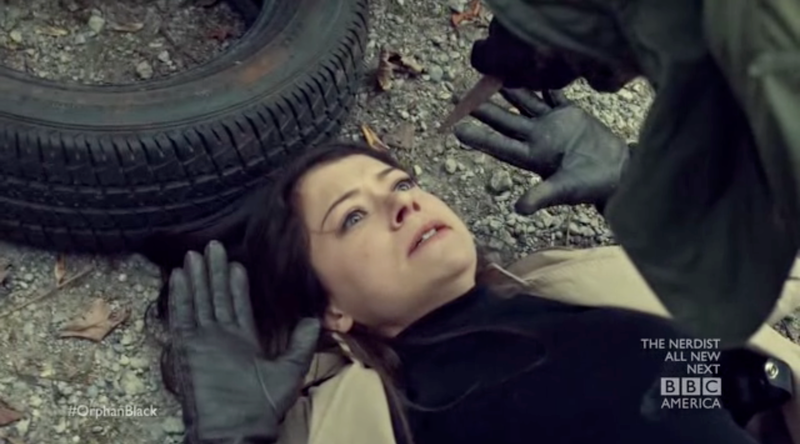 If examined in connection with her mental and moral state at critical points in Orphan Black, Helena’s duality of hand use becomes a lot more interesting, and can even help us look at Helena’s many other dualities in a whole new light. Raised by an extremist religious group known as the Proletheans, Helena was ritually abused and brainwashed into believing that she was the original clone and that her genetic identicals had to be killed in order for her to be redeemed in the eyes of God. It isn’t a far stretch to assume the dogmatic Proletheans would have subscribed to the now-largely-discredited view that the left hand is connected with sin. Since a right-hand bias is a prominent theme in the Christian Bible, it’s likely that Tomas and his cronies forced Helena to use her right hand, which is religiously associated with strength, power, and honor, instead of her dominant left, which traditionally symbolizes weakness and foolishness. It's also quite likely that Helena's handedness stems from the fact that she and Sarah are twins, as Helena is the only clone who's a lefty and left-handedness occurs about twice as often in twins as in the normal population. If the Proletheans did force Helena to use her non-dominant right hand, it makes sense thematically that she would use this hand in her attempt to murder Sarah-as-Beth when they first meet, since she is under direct orders from Tomas. Her forced right-handedness is a product of her manipulation at the hands of the Proletheans, just as the rest of her beliefs are. She has been conditioned to follow, and do only as she is told. It is not until she meets Sarah, however, that Helena “sees a light,” and truly begins to question what she has been taught. We see this subtle shift not only in how Helena’s approaches Sarah when we see her again in “Parts Developed in an Unusual Manner” ("Let's have lunch," rather than, "Prepare to die"), but also in her dominant hand usage. When Helena meets Sarah at the diner, she wants to befriend her; she “dreamed that [they] were friends.” She has begun to think for herself and is tentatively independent of the Proletheans and their beliefs. It is here that she uses her left hand, a tendency she was probably born with. She reverts back to her own nature and, in doing so, discovers a sense of newfound freedom. Contrary to what the Bible symbolically states about hand dominance, Helena finds the power and strength of her autonomy in her left hand, and begins to see her right hand as an obedient tool of weakness. It also seems that Helena’s forced ambidextrous duality rises to the surface again based on the characters she is interacting with. When she meets Kira for the first time, for example, Helena presses her left hand against the glass door or Mrs. S’s house. But, when Helena returns back to Tomas, who locks her in a cage for having defied his instructions, it is with her right hand that she desperately reaches out for him. Later, Helena asserts her own autonomy by holding the gun in her left hand as she threatens Tomas. However, when Helena learns from where she truly originates, and that she is not the original, her anger toward Amelia’s existence causes her to revert back to the righteous killer the Proletheans have made her. “You gave me to them. You let them make me this way,” she says to Amelia. And when Helena attacks Amelia, it’s with (you guessed it) her right hand, the hand with which she has been taught to extract vengeance. Finally, in her very last scene, when Helena encounters Sarah once again, the two are diametrically opposed; Sarah, grieving the loss of her birth mother and recovering from the near loss of her daughter, is no longer on Helena’s side. Helena, too, has made her break from Sarah by murdering Amelia and fully regresses back to the teachings the Proletheans have inflicted upon her. 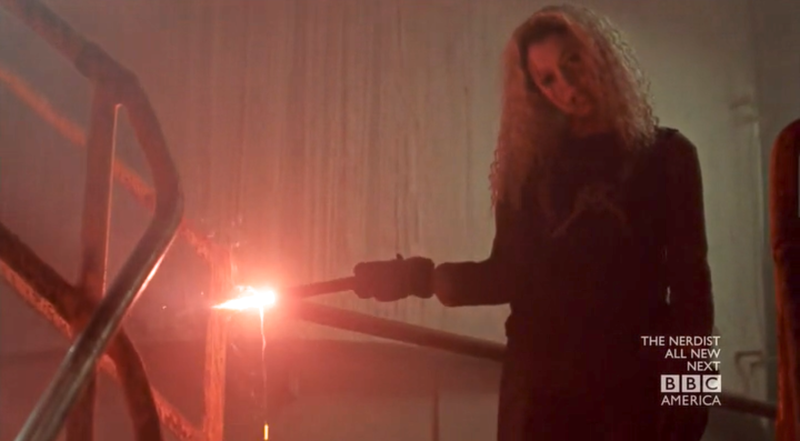 In this final scene, Helena holds the flare in her right hand. She returns to the only conflict-resolving action the Proletheans had taught her: violence. Here, Helena faces her death bearing the torch of the vicious life of which she has been a victim. But, despite Helena’s foray into self-realization, she does, in fact, remain sadly unredeemed at the end of Orphan Black’s first season. The fact that she almost escaped into left-handed autonomy and fully realized her strength and power as an individual makes her decline all the more heartbreaking. 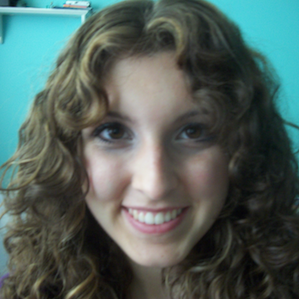 Ashley is a lefty, a chatterbox, and an enthusiast of basically everything. She wholeheartedly subscribes to the belief that chocolate always helps and tea never hurts either. I love the detail -- keep this up! hey - first hit that comes up in season 5, episode 8, when I re-noticed/realized Helena is lefty!